Re: Molnija pocketwatch Mainspring ? I'm looking for one of these for my 50's Molnija, but a recently made mainspring should be the same. Do you know where I could get one ? Or a good place (preferably in California, very preferably in the San Diego area) I can take it to get one made? I need a cresent moon calendar hand and a black seconds hand that's shown in the image below for my Poljot. Please PM me if you have it. Appreciate the help. Thanks! Any watch maker worth his salt can fit one as well. From a Poljot 3133 I need part number 8140 as shown on the diagram below, not sure what it is called. I can pay by PayPal and would be prepared to buy a whole busted movement if needed, any help would be much appreciated. Last edited by The Time; April 9th, 2008 at 22:19. Need please second hand in red and arrow hour hand for a Komandirski sub theme so it may look like this. Last edited by Caliper1681; April 22nd, 2008 at 21:53. 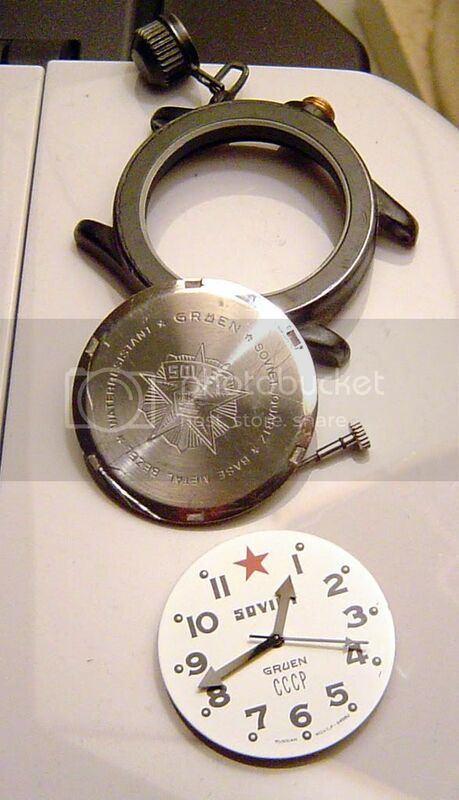 I am looking for a main spring or complete barrel assembly for Vostok 17j 2414 manual wind movement. Will consider complete running movement. Also, need good condition Amphibia bezel. I am located in the US. Thanks for any and all replies. It is the first time that I enter this permanent parts' thread. Have you found yr Rodina crown since 2 yrs now???? If not, contact me and I might be able to do something with this case. In fact I have one of my Rodinas for repair but I doubt it shall be ever repaired. So if it comes back dead I might be able to transplant its crown to yr mechanism-donate life to yr rodina! better hear yr tic-tac than keep weaping over mine's a dead body!! Does anybody, by any chance, has a rodina crown? Thanks.